Shortlisted for Military History Monthly's Book of the Year 2019 award. You'll be £35.00 closer to your next £10.00 credit when you purchase The Royal Navy's Air Service in the Great War. What's this? In a few short years after 1914 the Royal Navy practically invented naval air warfare, not only producing the first effective aircraft carriers, but also pioneering most of the techniques and tactics that made naval air power a reality. By 1918 the RN was so far ahead of other navies that a US Navy observer sent to study the British use of aircraft at sea concluded that ‘any discussion of the subject must first consider their methods’. Indeed, by the time the war ended the RN was training for a carrier-borne attack by torpedo-bombers on the German fleet in its bases – over two decades before the first successful employment of this tactic, against the Italians at Taranto. Following two previously well-received histories of British naval aviation, David Hobbs here turns his attention to the operational and technical achievements of the Royal Naval Air Service, both at sea and ashore, from 1914 to 1918. Detailed explanations of operations, the technology that underpinned them and the people who carried them out bring into sharp focus a revolutionary period of development that changed naval warfare forever. Controversially, the RNAS was subsumed into the newly created Royal Air Force in 1918, so as the centenary of its extinction approaches, this book is a timely reminder of its true significance. This is an excellent study of one of the most important parts of the Royal Navy during the Great War, and adds a great deal to our understanding of the air war, often dominated by studies of the RFC and RAF. David Hobbs is unmatched in his field, and the RNAS has found its definitive historian. Rigorously researched and engagingly written, peppered with as many personality led anecdotes of these pioneering days of naval flying as it is with hard facts and figures. It is a definitive history, and essential reading for any serious student of naval aviation or the First World War. Having now recently reviewed two books by Hobbs, his research and writings have definitely left me far better informed about the various incarnations of the Royal Navy's aviation branch than before. well-written, comprehensive and authoritative, this book will tell you pretty much all you need to know about the RNAS and, since that service provided a substantial chunk of the foundations that underpinned the early RAF, its contribution is probably less well-know than it deserves to be. Hobbs' book goes a long way towards putting the record straight. Strongly recommended. This is a valuable and authoritative volume, well worth its asking price. David Hobbs has a vast collection of photographs of the RNAS and uses them extensively throughout the book. This book is excellent and most strongly recommended. Hobbs enlivens his story with fascinating detail of the men involved. This human interest makes the story very readable; something made all the more possible because from its earliest days the RNAS attracted some remarkable characters. As is standard for Seaforth, the book is well designed and copiously illustrated. With the 100th birthday of its sad extinction approaching, Hobbs had provided us with a timely reminder of the significance of the often forgotten RNAS. This first-class history tells the story of the Royal Naval Air Service's operational and technical role both at sea and ashore, detailing its history from 1914 to 1918. David Hobbs is an accomplished historian and provides an excellent history in a tome which many readers may well want to add to their Great War bookshelves. The work offers detailed explanations of operations, the technology that underpinned them and the people who served during what was a revolutionary period of development that changed the face of naval warfare forever. In 1918 the RNAS became part of the newly formed Royal Air Force, but this work stands as the finest testament to the work it did and to those who served. This is a fine book, a ripping yarn and essential reading for anyone interested in air and sea power. As the RNAS and its gallant members have passed from living memory, this book is a worthy tribute to their memory. This book will become available from SEAFORTH books this month. I have been looking at it this past week and have found it a very impressive work by David Hobbs. Although I have read a lot about the RNAS over the years,and though I had a good understanding of it, but I found myself feeling like a novice when reading the wonderfully researched information in this book. The early days are fascinating and I confess I was quite unaware of the depth of early experimentation. Flimsy machines that look like they should never fly surprised me as I had not realised that the rather 'stuffy' Admiralty had allowed its young officers to mess about in such a way. True they made some get their own flying licenses and were not helpful with some of the expenses, but one cant help but feel there was a light of visionary thinking about the future of aircraft aboard ships. Of course the rather piratical RNAS armoured cars and linked troops that rushed into Belgium in 1914 are also covered and the various types of armoured cars are illustrated. But for myself, the story of how the RNAS developed throughout WW1 really had me reading on and on across pages of great information. The ideas behind the development of aircraft carrying warships, and later seaplane tenders, balloon tenders, and aircraft carriers is also discussed. In all it left me feeling that the author had left nothing out, and I had a greater sense of understanding of how the RNAS came about, and tragically was disbanded, than I have ever had. Bravo David Hobbs. A fine work or research and interesting reading. I could not give it any less than ***** five stars, because there is no other written work I can think of that even comes close to it for comparison. The book is profusely illustrated throughout with photographs and diagrams appropriate to the adjacent text. Many are from the author's extraordinarily extensive own, and other private collections so will not have been previously seen. Citations are carefully noted and an extensive bibliography is provided. My only gripe was having to keep a marker in the notes to pick up on asides as I read along. I look forward enthusiastically to the author's sequel relating to naval aviation between the Wars. An amazing account of the Royal Naval Air Service and the part it played in the aerial warfare of the first world war before it was swallowed up by the newly formed Royal Air Force. As someone with an ancestor by marriage who was a member of the RNAS, this book is especially fascinating to me and provides a vital and unique piece of aviation history. The author followed a career in the Royal Navy’s Fleet Air Arm, followed by a tour as curator at the Fleet Air Arm Museum, before becoming an accomplished author of naval aviation history. This new book is a substantial review of the RNAS during the Great War and includes a wealth of images to support the very able text – Most Highly Recommended. There is no need to tell any Warship World reader about Commander David Hobbs. He has been contributing to the magazine for many years and has a wealth of knowledge and experience of naval aviation within the Royal Fleet Air Arm and as a commentator on today’s naval aviation scene. For this, his latest work, he has gone back to the very beginnings of British naval aviation and how it was utilised during the Great War. Few people today would imagine that in 1914, as Europe started to fall headlong into the military abyss that would become the First World War, the Royal Navy was the world’s leading exponent of aircraft at sea. The first aircraft were flimsy and awkward to fly and those pilots who attempted to tame their aircraft at sea were amongst the best and bravest of them all. 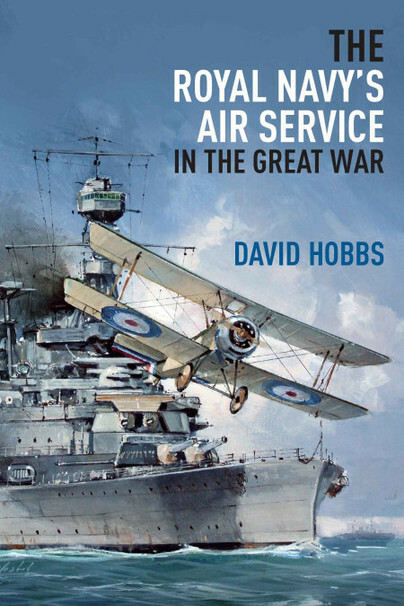 In this book David Hobbs has focused on the operations undertaken and technical achievements of the Royal Naval Air Service both at sea and ashore. Tactics and operational procedures were devised and tested as naval aviation, still only an infant in 1914, started to come of age. The RNAS was, however, much more than just a collection of planes and pilots. Within less than twelve months of the start of the war the organisation had grown to include balloons, airships, flying boats, seaplanes, armoured cars, ack-ack batteries, armoured trains and even tanks. The service had seen action in the Dardanelles, Adriatic, East Africa, Namibia, Russia and Romania. Whilst the RNAS flourished during the early days of the war, the Royal Flying Corps did not, and regularly used RNAS aircraft to bolster its own forces. This disparity led to resentment and political manoeuvring. For the Royal Navy the period is a bittersweet one as in 1914 the RNAS was the world’s largest aviation force but in 1918 all naval aircraft were subsumed into the fledgling Royal Air Force. The Royal Air Force’s creation led to the wholesale transfer of RNAS aircraft and personnel and the complete failure to secure a role for maritime aviation. David Hobbs' timely book details how the politics of the time dictated the course of naval aviation and to how the Royal Navy would eventually, some twenty years later, finally regain control of its own organic air power wresting it from the control of the Royal Air Force which never really cared much for the maritime environment. This book is an excellent, enthralling and entertaining read and is filled with great detail, photographs and diagrams. Utter absorbing read. David Hobbs is a well known author and naval historian. He has written eight books and co-authored eight more. He writes for several journals and magazines and in 2005 won the Aerospace Journalist of the Year, Best Defence Submission. He lectures on naval subjects worldwide and has been on radio and TV in several countries. He served in the Royal Navy from 1964 until 1997 and retired with the rank of Commander. He qualified as both a fixed and rotary wing pilot and his log book contains 2,300 hours with over 800 carrier landings, 150 of which were at night. His extensive naval aviation experience gives his latest book 'A Century of Carrier Aviation' an authentic edge.